Plot Summary: A strong and eager, but sexually very inhibited girl joins an elite police team in the future Tokyo. There, one of her colleagues, a beautiful and sexually not-a-little-bit-inhibited woman awakens her sexuality. 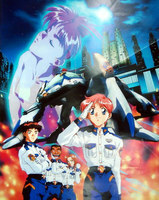 Tokyo Private Police is a mix of mecha fights and sexual interaction.